The Positive Youth Education (PYE) Project exists to inspire and enable young people to reflect on how they perceive themselves, their home, their communal environments, and the learning acquired within these spaces and interactions. Early social experiences influence a young person’s decision-making processes and for some these will have negative impacts. This can include; failure in education, unemployment and social exclusion, as well as the rationalization of crime, serious violence and gang affiliation. 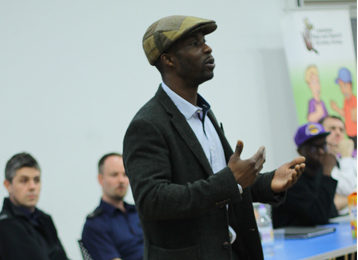 The project began in 2003 as the inspiration of the founder and current Director, Emmanuel Imuere. After the success of the pilot project delivered in in the London Boroughs of Lewisham and Lambeth, the Company ‘The PYE Project Ltd’ was constituted and registered in May 2008. Since then PYE have continued to expand and broaden their work and have developed a wide range of services, forming successful partnerships with several other boroughs including, Merton, Bromley, Camden, Wandsworth, Ealing and Southwark. The PYE Project now works with young people, communities, youth services, policy makers, local groups, businesses and artists, with the aim of facilitating the development of a confident and constructive generation of young people. Our work comes highly recommended and has been recognized for good practice by the Home Office, Lewisham Youth Offending Service, High Trees Community Trust, SB Medical and Bromley Mytime; as well as being featured on the award winning Paul O’Grady show and MTV. Our projects have received funding from; End Gang and Youth Violence, Communities Against Guns Gangs and Knives, Big Lottery Fund and Media Box. “I set up PYE over 10 years ago as a project inspired by the need for BME led, grass roots youth organisations in South East London. I remain 100% active in the everyday running of PYE and my role is as diverse as ever. I take a keen interest in every aspect of the business, from training and mentoring staff, to hosting events. But perhaps my true passion lies in the ‘hands on’ work with the young people PYE support and advocate for, this is the aspect of our work I am devoted to and extremely proud of. I am very fortunate to have gathered and built a skilled team with an ability to truly engage with and support young people considered ‘hard to reach’ or ‘hard to help’ – every day we are privileged to work with potential future leaders and world changers. Most of all I am determined to see a reduction in young people becoming involved with criminality, gangs and violence. To achieve this PYE must not only work with young people, but also engage fully with policy makers and proponents for change in our communities. This is why I personally advocate for the rights of young people as Chair of the Lewisham Stop and Search Scrutiny Group and as a member of The Safer Neighbourhood Board. What was your first experience of PYE? I First came into contact with Emmanuel and PYE when I was about 14 or 15. It was at a time where most boys of similar age and social status started to pick up rapping. It was the ‘Grime Era’ so it didn’t go any further than ‘spitting in the block’ over some beats on some random guys sony Ericsson W810i. My first impression at the time was amazement, as Emmanuel had? shown up with Hector From regal players who had the track ‘Rude-boy’ that had done pretty well. Hectors skill in rapping were far better than ours so we were pretty much looking up to him as a mentor. When did you beginning working for PYE? It was so long ago I don’t actually remember when I first started working for PYE, but it must have been at a summer Uni project in Hightrees, so I must have been maybe 18 or 19. being taken on board by PYE made me feel valued and made my efforts that I had been doing behind closed doors appreciated. It had a heavy impact in my day-to-day life and future career. it gave me the opportunity to further develop my craft while working and enjoying myself at the same time. and most of all it helped me develop confidence to be a group leader and speak in public and believe in myself. Right now I am going into my final year of University studying Commercial Music at the University of Westminster. I’ve also recently been involved in projects with publishing labels in Germany where I’ve attended writing camps for Sony ATV and EMI Publishing. I often am called out to various international recording studios to assist or lead projects for major and independent labels/artists. PYE have played the most influential role in making all of this happen, starting from the mentoring provided by Emmanuel and PYE, all the way to the network it has provided me to build through their many allies and friends. If not for the support of PYE I would not have had the chance to make it into University, or the chance to develop on my skills at all. They provided me with the guidance and facilities that I need at the time of getting started and I will forever be grateful for that. What has been your overall experience of The PYE Project? My overall experience with PYE has been unbelievably, the amount that they have helped me to achieve in what would seen such a short amount of time is, for me, crazy. I? ?ve enjoyed every step of the way and have thoroughly enjoyed the entire PYE team who have transitioned from being mentors to irreplaceable friends and anchors in my life. I would absolutely recommend PYE for their unquestionable commitment and their intimate and nurturing approach to development of character and skill. I have been really impressed with the impact the programme has had on the young people; they speak enthusiastically about the elements of the work that has clearly had an impact upon them and their thinking. You guys have been amazing, our son has really progressed since working with you. His attitude and behaviour has significantly improved.